Designed specifically for road bicycles. From road-specific cable heads to brake pads for carbon rims, these components fly down the road. Compatible with cable-actuated braking systems on road bicycles. Ultra-slick cables have extra surface treatment to dramatically reduce friction. These ultra-slick stainless cables deliver the ultimate low-friction performance. 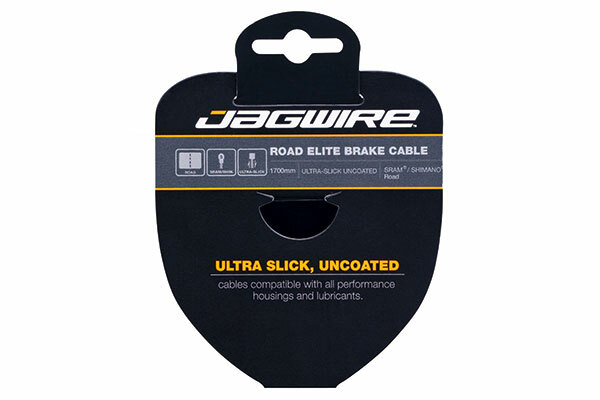 Jagwire offers two options: An ultra-slick polymer-coated cable for use in our Elite Sealed Systems with continuous housing/liners, or a highly polished, uncoated cable that can be used with any housing and lubricant. These Elite level cables deliver incredibly accurate, smooth performance.